Non-profit organization Osners Foundation is pleased to announce their plans for a quarterly medical drive to help combat sickness and malnutrition among the children of Haiti. It is through these medical drive that Osners hopes to sustain the health of Haiti’s future while also inspiring others to do the same. Beginning in 2017, Osners foundation will perform medical drives by employing the help of nurses, doctors, dentists, and other members of the medical community to assist those whom are unable to afford proper medical care. Osners realizes that in order to secure the country’s future, their children must be cared for first and foremost, which can only be accomplished by allowing them to develop in a safe, nurturing, and healthy environment. According to statistics provided by UNICEF the infant mortality rate in Haiti is 55 per 1000 births. In addition to this moderate to severe stunting is at an outstanding 22%. These unfortunate statistics are a direct result of poor health and malnutrition, something Osners Foundation aims to remedy through their planned medical drives. Osners Foundation has already making strides towards improving health and wellness in Haiti through the operation of their Athletic Academy, which promotes an active and physical lifestyle through the use of soccer. Anyone interested in doing their part but unable to travel can either volunteer at Osners’ corporate office located in Garden City, NY or donate a monetary contribution via Osners.org. Contributions will not only go towards medical care but nutritious meals and clean drinking water as well. President and co-founder of Osners foundation J. Ronald Nazaire spoke on the current health issues taking place stating, “In various parts of the world, the little things we take for granted are considered luxuries. It is our job our as the more fortunate to not just wish for change, but also be the change in order to truly make a difference, something we at Osners have set out to accomplish”. He continued “If the future of this beautiful nation [Haiti] is to prosper, then we must start with ensuring the success of its children”. Further news regarding Osners’ medical drives will be announced once planning is complete. The first drive has a projected start date of Q1 (first quarter) 2017. 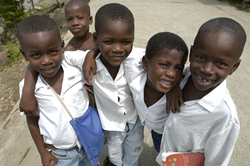 Osner’s Foundation is a 501 (c) (3) non-profit organization, whose mission to drastically improve the lives of orphaned children across the nation of Haiti. Our mission will solely rely on voluntary contributions, fundraising activities, and grants.